NIFT Admit Card 2019: National Institute of Fashion Technology (NIFT) conducts a national level entrance examination to offers admission in the field of design & fashion technology. To appear in NIFT 2019 students will have to fill the online registration form and submit it before the last date along with exam fee. NIFT Hall Ticket will be issued only those candidates who have completed their online registration process successfully. It will be available through online process only. Here we have mentioned all the information related to NIFT 2019 Admit Card such as admit card release date, downloading steps, important instructions etc. Candidates can check the NIFT 2019 Admit Card Date with exam date. Date is not confirmed yet but will be announced shortly on its official portal. It will be available on the official website 15 days prior to exam date. Here we have shared simple steps to download the admit card. Visit the NIFT official website. Go to the “Admissions” option available on the home page. Search for the NIFT Admit Card download link and click on it. Enter the application no & date of birth and then submit it. The admit card will be displayed on the screen. Click on “Download” button to download it. Take the 2 or more copies of print-out of it for further use. Read all the instructions listed below carefully before appearing for the NIFT exam. The candidates should report to the exam center before the 60 minutes before the commencement of examination. Applicants should carry the NIFT Hall Ticket 2019 along with an id Proof (Pan card, Aadhaar Card, Voter ID, Driving License Etc.) to the exam center else they will not be allowed to appear for the exam. In order to get entry in exam hall, students must show Download NIFT Admit Card to the invigilator present at the exam center. NIFT will not send the hard copy of hall ticket via post or courier to any candidates, so go to the NIFT Entrance Hall Ticket download link to get your admit card. After downloading the admit card, must verify all the details mentioned over it. In the case any discrepancies, you may contact to the NIFT officials immediately by sending email. 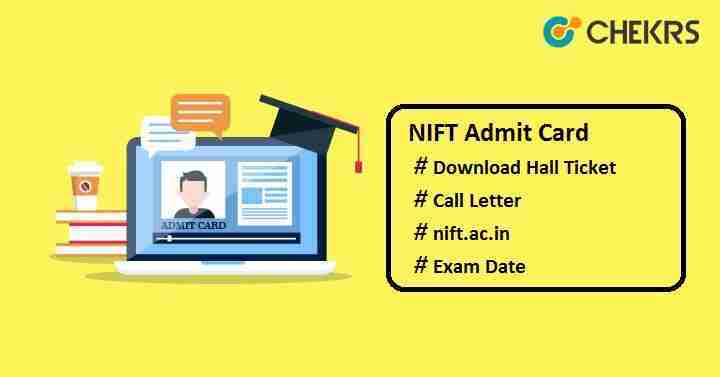 If you face any problem while downloading NIFT Admit Card 2019 then you can ask us immediately in the comment section below, we will reply you for sure. Till then Keep visiting our website for more updates.